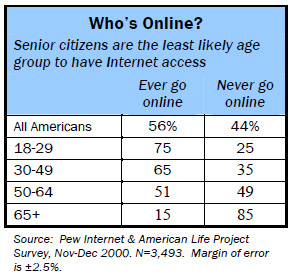 Senior citizens are among the least likely people in America to have Internet access. Just 15% of Americans aged 65 and older go online, compared to 51% of their closest peers, those aged 50-64, and 56% of all Americans. Almost half of Internet users were first given the opportunity to go online at work or school, but few Americans over age 65 were in the workforce or attending classes in the 1990s. And while many younger Americans are drawn to the Internet to keep in touch with friends, there is a very small peer group to urge seniors to take the plunge. In addition, many seniors can’t afford the luxury of a computer or the monthly fees associated with Internet access. The extraordinary four million seniors who do go online have fallen in love with email as much as any other group of Internet users, but their motivation for going online and some of their activities are unique to their age group. Today’s online senior citizen population looks like the early Internet population – about 60% are men and about 40% are women. Wired seniors are more likely than their offline peers to be married, highly educated, and enjoying relatively high retirement incomes. Seventy-four percent of wired seniors are married (or living as married) compared to 47% of all Americans over the age of 65. Eighteen percent of wired seniors are widowed, compared to 39% of all seniors. Seventy-six percent of wired seniors have at least some college education, compared to 36% of all seniors. One in four wired seniors lives in a household with an annual income of over $75,000, compared to just 8% of all seniors. Seniors with the most online experience are college-educated, wealthy men who are more likely to have been introduced to the Internet at work. For example, 32% of online senior men have three or more years of experience, compared to 14% of online senior women. At the other end of the spectrum, 25% of online senior women have had Internet access for six months or less, compared to 14% of online senior men. However, Americans over 65 years old, especially older women, are coming online at faster rates than other age groups. Eighteen percent of seniors with Internet access have come online in the past six months, compared with 14% all Internet users who have gotten access in the same period. More than half (55%) of all senior citizens who have gotten Internet access in the past six months are women. While a smaller share of senior citizens has access to the Internet, on a typical day they are more likely to log on than the average American Internet user and the trend for online seniors is going up. In May-June 2000, 64% of wired seniors went online on a typical day. In November-December 2000, 69% of wired seniors went online on a typical day, compared to 56% of all Internet users. Senior citizens resemble no other age group when it comes to where they use a computer to go online. Fully 81% of wired seniors only have access to the Internet from home, compared to 45% of all Internet users. By contrast, wired seniors’ closest generational peers (Internet users in the 50-64 year-old group) are more likely to have access at work. Just 45% of those pre-retirement Internet users report having access only at home. Five percent of wired seniors go online from work only, compared to 12% of all Internet users. And only 11% of wired seniors go online from both home and work, compared to 37% of all Internet users. Interestingly, those in the pre-retirement age bracket (50-64 year-olds) are actually more likely to have access at both home and work than 18-29 year-olds – 40% compared to 30%. Since very few have access elsewhere, it is not surprising that 95% of seniors who are online on a typical day are logging on from home, compared to 76% of all Internet users. Since most senior citizens are not working or in school, it is not surprising that they are motivated to go online for more personal reasons than all other age groups. For them, a prime reason to go online is to connect with their children and grandchildren, not with their friends. Indeed, of the 84% of wired seniors who say they first got Internet access for reasons unrelated to work or school, 48% say they were encouraged to do so by family members – a higher percentage than any other age group. Another 45% say they first got Internet access because it was something they personally wanted to do. Very few wired seniors who first got online for personal reasons say that they were encouraged by friends to get access. By contrast, 52% of all Internet users say they were compelled to go online for personal reasons, not work or school, and friends had a greater influence than family members in urging younger Americans to try going online. Like most Internet users, wired seniors value the Internet as a useful tool to stay in touch with family members. Wired seniors who email a significant family member, often a daughter or son, are likely to say they communicate more often with that person now that they use email. Nearly 3 in 5 online senior citizens (56%) say that the Internet has improved their connections with family. This enthusiasm for family ties is matched in the general Internet population, but younger Internet users are more impressed than online seniors with how well the Internet helps them learn new things. Seventy-nine percent of all Internet users say that, compared to 54% of wired seniors. A great majority of senior citizens engage with life by reading newspapers, watching television, and pursuing hobbies. For example, 57% of seniors read a newspaper on a typical day, compared to 40% of all Americans. While many Americans have begun to shift some of those activities online, older Americans remain entrenched in the offline world. Only 21% of Americans over the age of 65 say they use a computer on “at least an occasional basis,” compared to 59% of their closest peers (age 50-64) and 64% of all Americans. Seniors are the least likely group to have tapped into the Internet revolution – and those seniors who do have Internet access are less likely than any other age group to have sampled all the Web has to offer. They are enthusiastic about some online activities and relatively indifferent to others. Many wired seniors search for financial news, but few do their banking online. 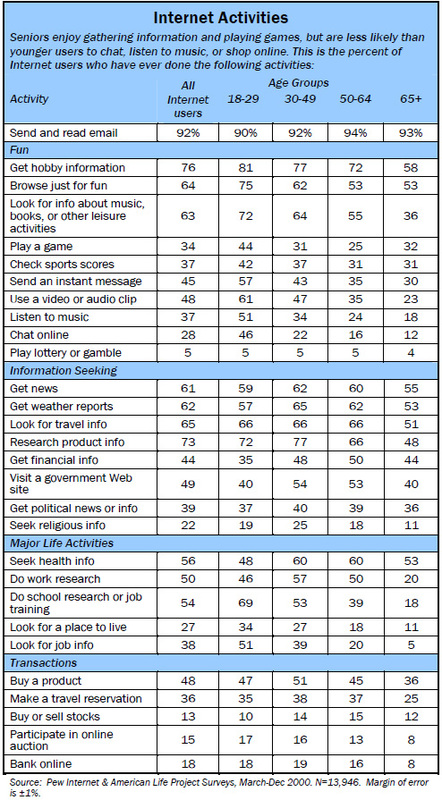 Many wired seniors play online games, but few download music (see “Internet Activities” table on page 9). Because so many seniors came online only within the past year, some observers might assume that seniors’ lack of engagement with most online activities is simply due to their lack of experience. However, Internet users with less than one year of experience online in the general population are more likely than seniors as a whole to have tried many of the activities we research. Email is the #1 draw for seniors. Email is the application that has most engaged senior citizens with the Internet. Ninety-three percent of wired seniors have sent or read email. On a typical day, wired seniors are more likely to send email than the average Internet user. Some 53% of all seniors with Internet access go online to check email on a typical day, compared to 48% of all Internet users. That figure suggests that on any given day about two million seniors are using email. Email is popular with every group of seniors – men, women, those with advanced educations and those with just a high school education. Hobbies: As with the general population, the second most popular online activity among seniors is seeking out information on hobbies. However, the gap that pervades most activities between seniors and the general population starts here. Fifty-eight percent of wired seniors have searched the Web for information about their pastime, and 12% do so on a typical day. By comparison, 76% of all Internet users have done this, and 18% do so on a typical day. Interest in online hobby information is roughly equal between senior men (59%) and senior women (56%). Wired seniors with three or more years of online experience are more likely to seek out hobby information than the newest initiates (69% vs. 41%). Thirty-seven percent of wired seniors say the Internet has improved the way they pursue their hobbies, compared to 51% of all Internet users who say that. Money. When it comes to finances, wired seniors match the general Internet population’s enthusiasm for financial news and trades online. Forty-four percent of wired seniors have looked up stock quotes and other financial information online, compared to 44% of all Internet users. Twelve percent of wired seniors have traded stocks online, compared to 13% of all Internet users. Twenty-three percent of wired seniors say the Internet has improved the way they take care of their personal finances, compared to 27% of Internet users who agree. While seniors appear comfortable managing online portfolios, they are less comfortable dealing with their bank accounts in cyberspace. Only 8% of seniors have tried online banking, compared to 18% of the general Internet population. Within the senior population, as in the general population, online financial transactions are primarily the purview of men, those with incomes over $50,000, and those who have been online for over three years. Health. Since senior citizens are more likely to suffer health problems3 it is not surprising that many wired seniors search the Web for medical advice and health information. According to a recent study in the Proceedings of the National Academy of Sciences, health education is one of the factors that have decreased the number of senior citizens who are chronically disabled and require nursing-home care.4 Indeed, wired seniors are as engaged as the general Internet population in pursuing medical advice online. Fifty-three percent of online seniors have sought health information online, compared to 56% of the general online population. 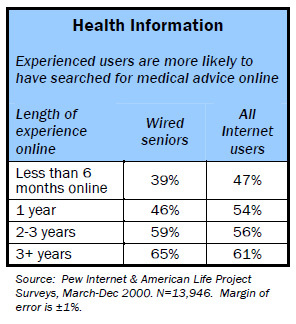 On a typical day, 7% of wired seniors seek out health information, compared to 6% of the Internet population at large. Thirty percent of wired seniors say that the Internet has improved the way they get information about health care, compared to 36% of all Internet users who agree. Seeking health information is one of three activities in which online senior women outdo the men (58% vs. 51%). Senior women are also more likely to go online just for fun and to play games. Neither income level nor educational attainment makes much difference in whether or not seniors seek out health information. 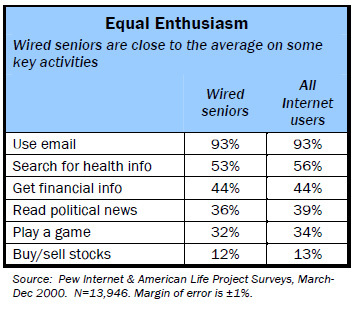 However, experience with the Internet does make a difference, one that is more sweeping for seniors than for the population at large (see table above). News. Fifty-five percent of wired seniors have gotten news online, and 21% do so on a typical day. By comparison, 61% of all Internet users have followed the news online and 21% do so on a typical day. As is characteristic of all Internet users, this activity is more popular with senior men and seniors with more Internet experience. Fifty-nine percent of wired senior men have read the news online, compared to 48% of wired senior women. Sixty-two percent of wired seniors with three or more years of experience have gotten news online, compared to 46% of wired seniors who just got Internet access in the last six months. Weather. Fifty-three percent of wired seniors have looked for weather reports and 15% do so on a typical day. By comparison, 62% of all Internet users have checked the weather online and 16% do so on a typical day. Wired senior men do this more than women (57% vs. 51%) and those with more experience do so more than those with less experience. Sixty-three percent of seniors who have been online for three or more years have checked the weather online, compared to 47% of seniors who have come online in the last six months. Browsing for fun. Fifty-three percent of wired seniors have gone online for no particular reason, just for fun or to pass the time and 17% do so on a typical day. By comparison, 64% of all Internet users have browsed the Web just for fun, and 20% do so on a typical day. Wired senior women do this more than men (58% vs. 51%) and those with less education do so more than those with a college degree. Sixty-three percent of wired seniors with a high school education or less have surfed for fun, compared to 46% of wired seniors with a college degree or more.